Maximising Global Visibility of Brands & SMEs Online. Our search & digital marketing excellence ensures that our data-driven strategies deliver long term results and deliver impressive ROI for our clients. We use our expertise, experience and bespoke technologies to provide clients with industry leading in-house support services and strategic guidance. A day full of inspiration, innovation and actionable insights from the very best in the industry. Apply for your ticket here. Issue 5 of our quarterly search marketing publication – Benchmark – is now live. Full of news, interviews, vlogs, blogs and podcasts, as well as features by our experts. Read now. Our team is always looking ahead and we’ve created this handy infographic to highlight the 20 tips that will get your business ahead of the competition. View infographic. We're Search	Agency of the Year! In recognition of our recent business performance we have been rewarded with the accolade of Search Agency of the Year. Read our blog announcement to find out more. Our team is comprised of passionate search marketing professionals who have a reputation for delivering results. Meet our team. Our search marketing excellence ensures that our data-driven strategies achieve long term results and deliver roi for our clients. View our case studies. Built on a foundation of technical excellence, our experts excel at delivering highly creative search marketing campaigns across paid, earned and owned media. Find out more. We use, or develop, the best software and technologies to deliver search marketing excellence for our clients. Find out more about our industry-leading suite of trax technologies. We’re committed to sharing our knowledge through eBooks, whitepapers and blogs. Get in touch and let’s begin to lay the foundations of your next search marketing project. We are a multi award-winning full service digital and search marketing agency that has been specialising in search engine optimisation (SEO) since 2003. 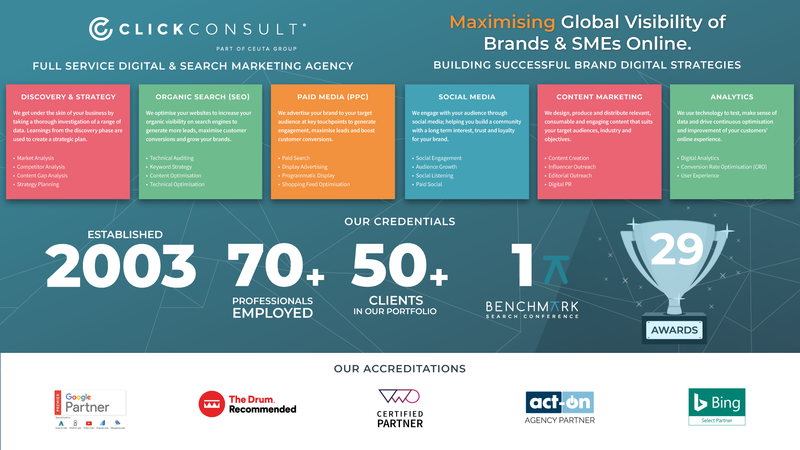 During this time, our team of Google certified professionals have worked with a diverse range of brands and SMEs including Oxfam, LloydsPharmacy Online Doctor, Chill Insurance and Kwik Fit, to develop and execute search marketing campaigns that deliver ROI. We craft bespoke campaigns that are tailored to the unique requirements of each client. Our services encompass organic search (SEO), paid search (PPC), content marketing, conversion rate optimisation (CRO), display advertising and social media. Whether you’re looking for an organic search strategy that increases your traffic or a paid search campaign that sets your company apart from its competitors, our team of in-house search marketing experts can help to accelerate your brand’s online growth. Ask a member of our team to devise a bespoke strategy for you today.